It's part two of my reckless orders frenzy and their safe arrival. Fortunately the three Lilies that arrived today from Crug Farm (in a box big enough to breed rabbits in, but safe and sound, currently experiencing a Siberian front outside) are planted in a very loose, woodland soil so are untikely to tip the balance on the roof but I'm no structural engineer! I'll get to the Crug Farm delivery in due course but this lot got in first! WOW! 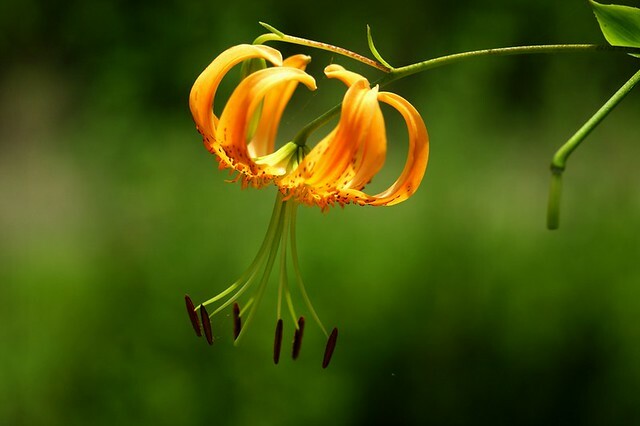 Lilium lophophorum, a very special plant indeed and photographed stunningly by someone uncredited. Says Paul Christian, he of the Rare Plants nursery, probably the best place in the UK to get things like this: "East to grow but very slow from seed, and infuriatingly these germinate within the green pod in our climate - you have to be alert to get this one sown! Short Stems, just 15-20cm, with disproportionately large yellow flowers with long twisted segmentsm initially joined at the tips. Likes cool, damp peaty conditionsbut good drainage. A lovely dwarf Lily which should be better known, especially in view of its strong but light fragrance of Lemons." You said it Paul! Lilium Leichtlinii: An extremely variable species from Japan with reddish-purple spots grows in the wild only in central Honshu, among tall grasses in rich, moist, meadows. The stem is purplish; the buds (and the outside base of the tepals) are wooly. Height varies from 2-4 ft. The "ordinary" species is the one with the yellow flowers (below) and var. 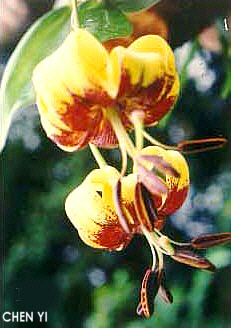 maximowiczii (above) is yet another orange Turk's cap. Lilium Superbum: It can be yet another of those orange Turk's cap or it can be the wonderful specimen below which is just so much more interesting. I hope there's a variety across my 75 seeds, not that I've got anywhere to bring them on to flowering age. Grows from 3-7ft and can have 3-40 blooms per stem so I think the word "variable" best described this species. Native to the eastern and central regions of North America and happy growing in almost marshy conditions, although I imagine it would prefer a little more drainage but certainly not dry. Lilium pumilum. A stunning, vivid red unseen anywhere else in the genus (feel free to prove me wrong!). This ia a particularly vivid example, it can vary down to a very deep pink. From North Korea (although I didn't see any when I was there), Manchuria and Mongolia. Apparently quite easy if well-watered. Lilium "Fata Morgana" is an Asiatic hybris with a difference! This semi-double, with upward-facing yellow flowers will reach 90-120cm and likes full sun to partial shade. It's an odd looking thing but I rather like it for that. And from Crug Farms, a hithero undiscovered source of Lily superiority, came the following today (obviously not in flower, it's November and around 0C outside!. Lilium pardalinum This is yet another of those orange Turk's caps that can vary to red with yellow throat markings like Superbum above. I'm just hoping I've got a red one! Sometimes known as the panther or leopard Lily, this is a native of Oregon and California where it usually grows in damp areas (hence the compost). Typically 2m high, unusually 2.5, it flowers in July and has many sub-species. 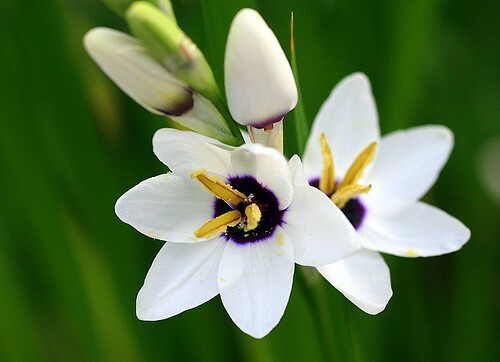 The bulbs are small and many are usually clustered together on a rhizomatous stock. Which is new to me! Lilium poilanei Thanks to Chen Yi for the image, there are not many about, photos or bulbs! To quote the grower "A beautiful highly scented species which formes slender stems with scattered lanceolate leaves, 1-2m tall, bearing 1-many large yellow pendant trumpet flowers with recurving tepals, stained red in the base August-October. From one of our 2006 seed collections from the Tram Trom Pass northern Vietnam, one of the few footholds that it had survived in, which unfortunately has since been devastated making way for a new road into China. Here it grew on shady vertical cliffs, rooting into cracks and narrow shelves. Best grown in a well drained fertile soil with plenty of moisture retention in part shade." Got in just in time then! Lilium rosthornii Yes, it's another orange Turk's cap but what a flower! 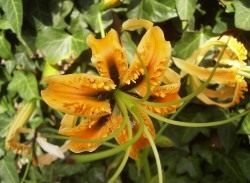 Over to expert Paul Christian: "A lovely Chinese lily which has become available only within the past few years, and only then after a considerable amount of confusion with Lilium henryi. 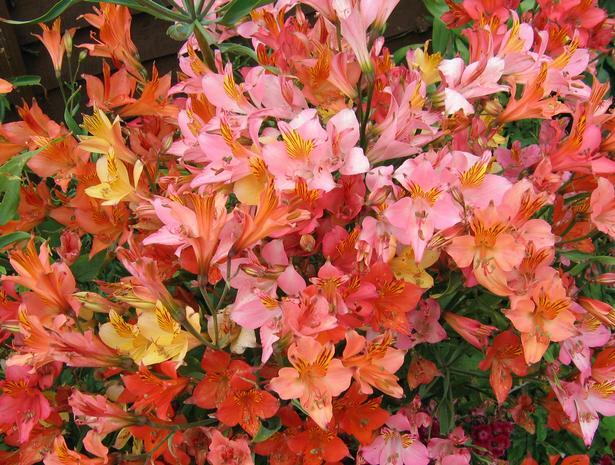 It makes a splendid display with well packed stems of about 90cm holding several blooms of a softer tangerine than henryi. The petals characteristically have quite long papillae on them and this combined with the later flowering habit, some six weeks after, henryi is sufficient to confirm their identity. Easy and readily grown in light shade in a humus rich soil outside. Despite its rarity, this is not difficult." Good! A papillae, by the way, is a tiny outgrowth on the surface of a petal or leaf. ( I had to look it up too). Bit brash but easy from seed and should flower in two years. I can give most away if they're not justifying the space! 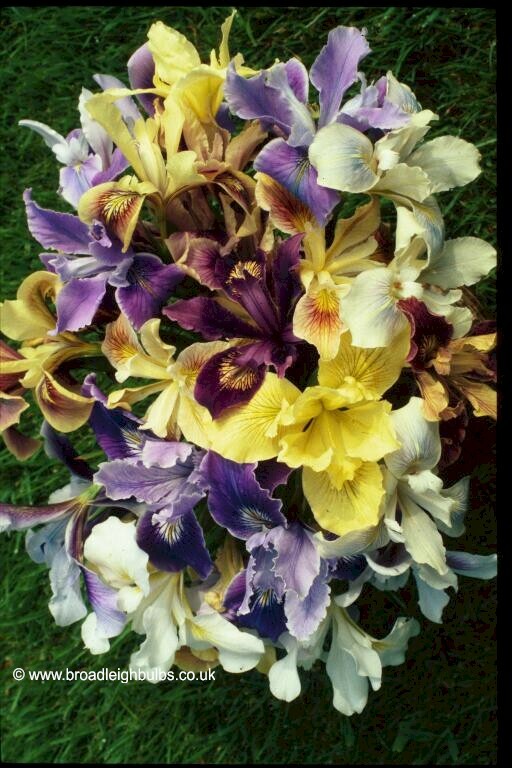 MORE Iris Sibirica mixed colours and Pacific Coast mixed hybrids too ( I just like surprises)! And 10 nice bulbs of Ixia "Bluebird"
It's very unlikely I'll get something as special as this but you don't know till you sow! Thanks to Broadleigh who are famous for their work with Pacific Coast iris and have many named varieties. One thing: they don't like being split. You really are crazy for these lilies aren't you?! I was always put off lilies on account of lily beetle which munches through any I planted, so I gave up. A friend of mine is growing some new hybrids of oriental lily bought at Cotswold Garden Flowers. Apparently these get up to 6', though I'll have to see it before I'll believe it! These days I'm very much into hardy exotic bulbs, Crinum, Nerine, Agapanthus (if it can be classed as a bulb), Eucomis and Zantedeschia. There are more, but these are the faves!